Damage to coastal property, primarily on the Gulf and East coasts, will total $120 billion per year by 2090. Labor productivity lost to warmer temperatures will amount to $155 billion. Climate change will cost the United States hundreds of billions of dollars each year by the turn of the century, a new study by scientists with the U.S. Environmental Protection Agency says. Water shortages, health costs associated with pollution and damaged infrastructure will be among the growing expenses incurred by the impacts of global warming, according to the study published in the journal Nature Climate Change this week. "There is a growing capability to project the impacts and economic effects of climate change across multiple sectors," the authors write. "This information is needed to inform decisions regarding the diversity and magnitude of future climate impacts and explore how mitigation and adaptation actions might affect these risks." Damage to coastal property, primarily on the Gulf and East coasts, will total $120 billion per year by 2090, the authors conclude. 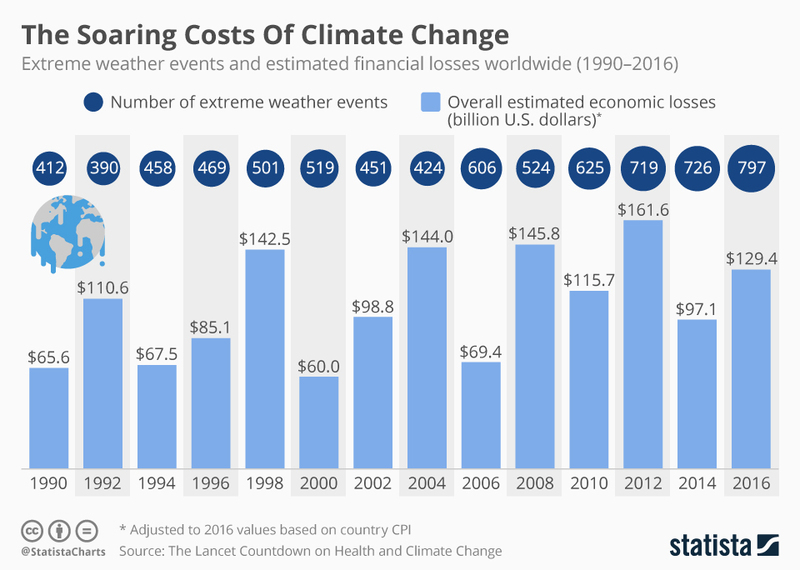 Labor productivity lost to warmer temperatures will amount to $155 billion per year and deaths from extreme heat waves and cold snaps will tally up to $141 billion per year. “There are no regions that escape some mix of adverse impacts,” wrote co-authors Jeremy Martinich and Allison Crimmins of the EPA. While southern states are expected to see the most dramatic effects of climate change from the impacts on coastal property, labor productivity and extreme temperature mortality, the north is likely to see a spike in electricity costs, more extreme flooding, algal blooms and higher air pollution mortality. In addition, many impacts are projected to be "greater in the eastern half of the United States than in the western half... For water quality, both sector models used project larger impacts to eastern states. This geographic pattern is in part due to larger population densities and urban areas in these regions," the authors write. Other impacts expected with global warming include more mosquitoes carrying West Nile virus, increased temperatures of streams and lakes, which will reduce oxygen levels and harm water quality. Repairs to infrastructure will be costly with heavy river flows placing many bridges at risk and extreme heat buckling rail lines.